Property Size 1,454 sq. ft.
750 Yarmouth Court is one is one of our favorite Luv Surf Vacation Homes and just 12 homes from the beach! With three stories of fully-furnished rooms and an attached spacious garage, enjoy the ultimate in accommodations anywhere in San Diego! This home’s third-story upper deck offers guest a relaxing view of Mission Beach. 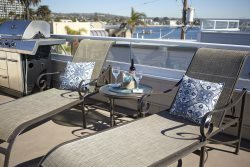 Enjoy the beach view with your morning coffee, or have an evening cocktail watching the beautiful San Diego sunset. Our Yarmouth Beach House features granite countertops, comfortable bedrooms and baths on each floor, large-screen TV, and much more! Our family had a quick spring break getaway at this property. It was wonderful! Our grandkids were so excited they had a TV in their room! Ha! However, the location to the beach and boardwalk is what we all loved! The house was very comfortable, well-stocked and clean. The 3rd floor balcony was a favorite spot for relaxing. Lots of great places to eat nearby. Loved it! We stayed at the Yarmouth house for two weeks with another family. There were 9 people and two large dogs in total and we were very comfortable. The set up was perfect with a master on the first floor for one couple and the master on the third for the other couple, and the kids all slept on the second level in the room and on the pull out couch. The location is fantastic. A very short walk to the ocean or to the bay. Lots of restaurants and shops are a quick walk or bike ride away. And the staff is amazing. We arrived hours before check in and were able to leave our luggage in the rental office and they brought it to the house for us at 3, giving us time to explore the area while we waited to check in. And anytime we needed something (body wash, laundry detergent...) if they were not in the office at the time, they would drop it off for us. We loved having the bikes, boogie boards, chairs and volleyball net. We put them all to great use! Our only suggestion is to also have a foldable drying rack or two on property. It would have made it easier to dry all the swimsuits and towels instead of draping them all over the shower rods. And a the rooftop deck only had seating for three...a small loveseat glider and one chair. Luckily, our friends drove there from AZ and had brought along plenty of bag chairs and a few folding chairs. The rooftop has plenty of room for larger furniture to make it more comfortable, but we still spent a LOT of time up there. The breeze at night was fabulous and we watched the Sea World fireworks from there every night. We rented paddle boards and kayaks a few times through the hotel across the street. There are places that may be cheaper, but we only wanted to use them for an hour or two and didn't want to have to lug them around. They were fantastic and we had a great time. We all agreed we would stay there again in a heartbeat! No one wanted to leave! Thanks Luv Surf for an amazing two weeks. My friends and I stayed at the Yarmouth house in May of last year for my birthday. The house itself was in great shape and very well maintained. With it being a 3 bed 3 bath house their was plenty of room for everyone. The best part was having the entire 3rd story of the house to myself with my own private deck that you could see the ocean from. Walking out the front door till the time my feet hit the sand only took about 30 seconds. So location to the beach was great. That being said, the location of the house was perfect. Within a 5 minute walk are several restaurants, bars, and shops that kept us busy during our stay. On top of all that, the customer service was supreme. The entire staff was very polite and if I had needed them for anything I felt very comfortable that they were just a phone call away. I can't wait to get back for my next birthday. **Click here to view more of our guest testimonials on our VRBO/Homeaway listing! Amenities included (but not limited to): HD flat screen TV's, DIRECTV programming, wireless Internet, fenced-in front patio w/ BBQ, third story outdoor deck, fully stocked kitchen, granite countertops, fresh coffee beans, grinder, and coffee maker, spacious garage that can accommodate up to two small cars or 1 large, all linens, towels, shampoo, conditioner, body wash, and lotion, blow dryers, high chair, pack n' play, boogie boards, bikes, beach toys, beach chairs, beach umbrella, and dog food, bowls, treats, bed & toys. PLEASE NOTE: This home, like many in the coastal area, does not have Air-Conditioning (We provide a floor fan for each room!). + queen sleeper sofa (sleeps 2).